Old wiring and interference from other devices can slow your DSL connection to a crawl. Spending a bit of time and money to improve your wiring can make a huge difference. It’s easy, and often quite appropriate, to blame your ISP if your DSL download speeds are much slower than promised. But sometimes the fault lies within your home. Old copper wiring, electrical interferences from other devices, and inadequate line filters can cause a lot of problems. As you probably know, DSL uses your legacy copper telephone wiring to carry data to and from the Web while those same wires also carry voice traffic. Unless you live in a brand new condo or house, chances are that copper wiring has been in place for years and could well be showing signs of wear and tear. That’s also true of the wiring that connects your home to your provider’s network. The outside wiring is the responsibility of the local telephone company. But wiring inside your home is your responsibility, whether you’re an owner or a renter. If you’re connection is much slower than your ISP promises to deliver, don't hesitate to call and complain. The first thing they should do is check your connection from their end and make sure it's stable and that it doesn't exhibit too much latency, a fancy name for delay. If your ISP then sends a techie, he or she should check the condition of that outside wiring and fix it if it is not up to snuff. Next, find the wall jack that is closest to where the telephone line enters your home and plug your modem into that jack. 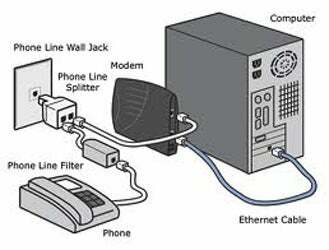 If that isn't practical, consider running a dedicated line from that jack to the phone jack closest to your modem or gateway device. If that still doesn’t help, you may need to have an electrician rip out the old telephone wiring and replace it. I did that in a home I used to own; it made a significant difference and was not terribly expensive. Electronic devices in the home commonly generate electromagnetic "noise" that can sometimes interfere with the DSL signal and reduce performance. If you are experiencing poor DSL performance, and your modem is connected near any large electronic devices such as a microwave oven (or even smaller devices like a cell phone charger), then you may want to try moving the modem (or the electronic device) to another location. Monitoring the DSL light on your modem or gateway provides an indication of how well your modem can maintain a connection to the telephone company’s DSL equipment at the other end of the line. If you see the DSL light blink from time to time throughout the day, then you may have an unstable DSL line configuration and should call your ISP. There's one more remedy that's rather drastic, may cost you more money, but will certainly work: Switch to cable or fiber to the home, if you can get it. They are faster technologies that don't rely on old wiring.